My husband and I learned to enjoy Southern dishes while living in Texas and Georgia. Grits are a favorite at our house, and we both love shrimp too. Here’s a delicious, main dish version of shrimp and grits, it’s perfect for Sunday brunch. I modified this version from Saveur Magazine to our taste, and we think it’s perfect. It is a last-minute dish when you use quick (not instant) grits, so have everything ready before you start. In a 2-qt. saucepan, bring 4 cups water to a boil over high heat. Reduce heat to low and whisk in grits. Cook, whisking frequently, until grits are tender and creamy, 4-6 minutes. (Whisk in more water for thinner grits.) Whisk in cheddar, parmesan, and season with salt; cover and set aside. Meanwhile, heat oil in a 12" skillet over medium heat. Add bacon and cook, stirring occasionally, until crisp, about 10 minutes. Using a slotted spoon, transfer bacon to a paper towel-lined plate; set aside. Reserve cooking fat in skillet. Season shrimp with salt and pepper. Over medium-high heat, add shrimp to skillet and cook, turning once, until bright pink, about 2 minutes. Transfer shrimp to a plate with a slotted spoon. Lower heat to medium; add mushrooms to skillet and cook, stirring occasionally, until tender, 5 minutes. Add garlic and cook until golden, 1 minute. Raise heat to high, add chicken broth combined with cornstarch, and scrape bottom of skillet with a wooden spoon. Cook until broth thickens, 3 minutes. Return shrimp to skillet along with the lemon juice, remaining butter, and hot sauce and cook, stirring frequently, until sauce thickens, about 1 minute. 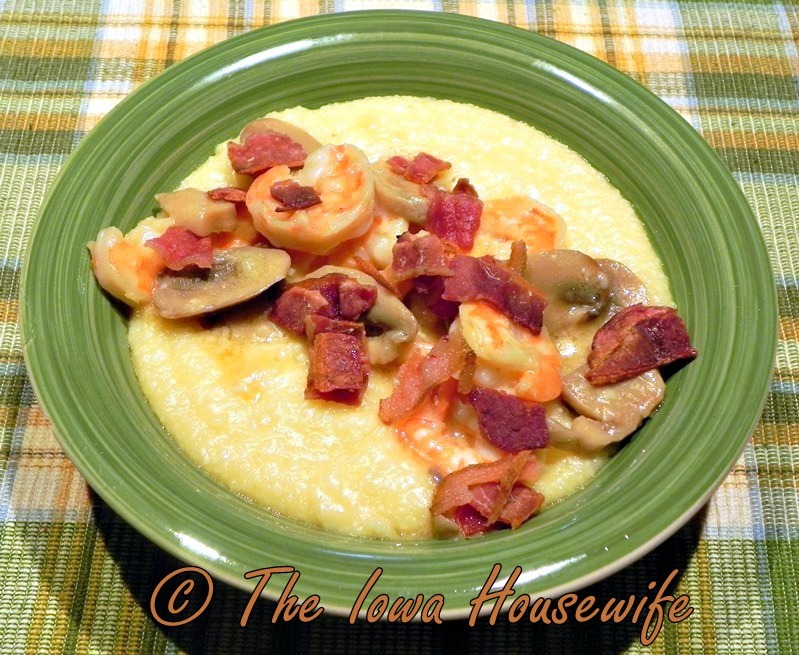 Divide grits between 4 bowls; top each with shrimp and its sauce. Garnish each bowl with bacon.